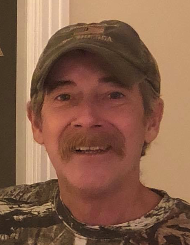 Marsh Lee Morrison, age 54, of Sanford, NC, died Sunday, January 27, 2019 at FirstHealth Moore Regional Hospital. He was born in Lee County, NC on October 4, 1964 to the late Mack Lee Morrison and Betty Mae Kelly Morrison. Marsh worked for Hanes Brand as a maintenance technician and was the sweetest person who loved his three dogs Coco, Pookie and Scooter. He would drive his dogs around town and also loved hunting, fishing and boating. Marsh felt his best on the water on his boat. Marsh is survived by sisters Linda Johnson and Robert, Jean Elliott and brother Danny Mack Morrison and wife Debra all of Sanford. His pride and joy were his great nieces and nephews – who he treated like his own children Cameron, Landon and Emma Grace Barbour. Marsh is also survived by numerous cousins, nieces and nephews who loved him greatly. The family will receive friends Wednesday, January 30, 2019 from 6:00 PM to 8:00 PM at Bridges-Cameron Funeral Home and at other times at the home of Linda Johnson. The funeral service will be Thursday, January 31st at 1:00 PM at New Hope Baptist Church with Rev. Darin Vogt officiating. Burial will follow at Lee Memory Gardens. The family asks that in lieu of flowers please consider donations to the funeral home to assist them with Marsh’s funeral expenses, 600 West Main Street, Sanford, NC, 27332 or www.funeraldonationapp.com.